The Deer Lakes are located at the southern end of the White Cloud Mountains, nestled amongst a string of peaks that make up the Germania Divide. Some may argue that this is actually part of the Boulder Mountains. After much "destination deliberation" JJ and decided on a loop that would start at the Three Cabins Creek trailhead, hike up the Galena Gulch Trail, then circle around to Deer Lakes and back to the trailhead. Splattski was also able to join us, so you know there are some peaks involved with this hike... The most likely peak options were Peak 10378' (Simpson Peak) and Peak 10488' (West Germania Peak). Peak names thanks to Rick Baugher. After about 4 hours of driving (Boise to Stanley via Idaho City, followed by the bumpy Pole Creek Road), we were off and hiking just before 10am. It was a brisk fall morning with temps in the 30's, but we warmed up by keeping a brisk pace up the trail. The tread was pretty well-worn and easy to follow for the most part, just a couple meadows where the trail was a little hard to find. Unfortunately, the three of us got separated prior to one of these meadows after JJ stopped to answer nature's call and adjust some gear. John and I had continued up to the 9600' saddle at the head of Galena Gulch, while JJ wisely stayed put in the meadow since he wasn't positive which direction we'd gone. We stayed at the saddle to eat lunch, and then eventually backtracked until we met up with JJ. After this hour delay, we were back on track and ready to roll. From the saddle, we left the trail and wandered to the east and the tarn behind Point 10283'. It was a nice setting, and JJ and stopped to pump some water while John started the climb up to the 10000' saddle on the ridge west of Simpson Peak. John was to the summit by the time we reached the saddle, and JJ decided to descend to upper Deer Lake for some fishing, while I hiked up the Class 2 ridgeline to join John on the summit of Simpson Peak. We enjoyed some great views of Castle, Glassford, and Galena Peaks. Once seeing that JJ had made safely down to the lake, we descended the peak's north ridge, and met up with JJ just in time to see him bring in a big old lunker trout. The lake was very pretty, with tall cliffs behind it, and we hung out for a while enjoying the views while JJ fished. Soon enough though, it was time to hit the trail. The next task for the day was to climb northwest from the upper lake to the other 10000' saddle south of West Germania Peak. Fortunately there was a goat trail most of the way the make for easier going up the scree slopes. From the saddle, it was an easy Class 2 ridgewalk to the highpoint. Once we made it to the summit, the weather was way too perfect not to lounge around and take in the views. It was a great vantage point to check out Castle Peak and numerous other peaks in the southern White Clouds. After some brief discussion on the best descent route, we ended up dropping down the north ridge of West Germania Peak to the saddle below Point 10052'. From there we made a quick scree-aided descent down a gully to the west, and then met up with the trail for the hike back to the car. I think we ended up being on the trail for about 8 hours including the morning SAR efforts, so a fairly leisurely pace to cover the 12 miles round trip and 3500' of elevation gain. It would be hard to beat the weather conditions we had, and scenery in the area was excellent. Overview map of the route, 12 miles and 3500' gain. We did the loop portion counter-clockwise. The view north down Galena Gulch, with the Washinton Basin peaks in the background. John at the Galena Gulch saddle. The west face of Simpson Peak. Deer Lakes and West Germania Peak from the ridge to the south. Castle and DO Lee from Simpson Peak. John descending to Deer Lakes. Cliffs above upper Deer Lake. John climbing to the saddle south of West Germania Peak. 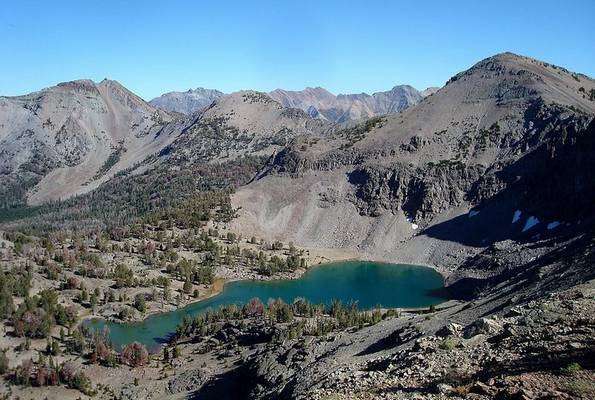 Deer Lake below, Glassford Peak in the distance, Simpson Peak to the right. The ridge leading north to West Germania Peak. The view south from West Germania Peak, Galena Peak in the background. Castle and DO Lee from West Germania Peak. JJ and John descending the norht ridge of West Germania Peak.